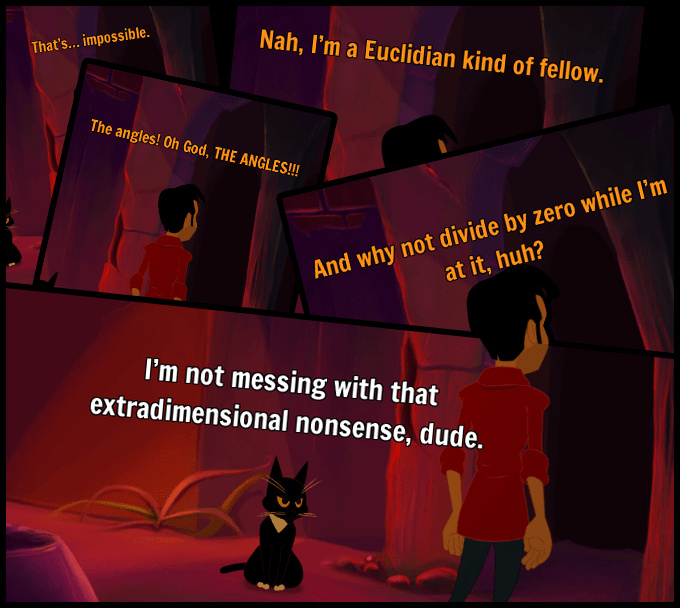 If you’re looking for a modern point and click adventure with the potential for serious comedic chops, then the Kickstarter for Gibbous – A Cthulhu Adventure needs to be on your radar. I’m always a little wary when it comes to point and click games, mostly because I spend why too much time trying to figure out what they want me to do. Even clever games get tedious when you’ve already clicked on every selectable item and your character still says they can’t do anything. 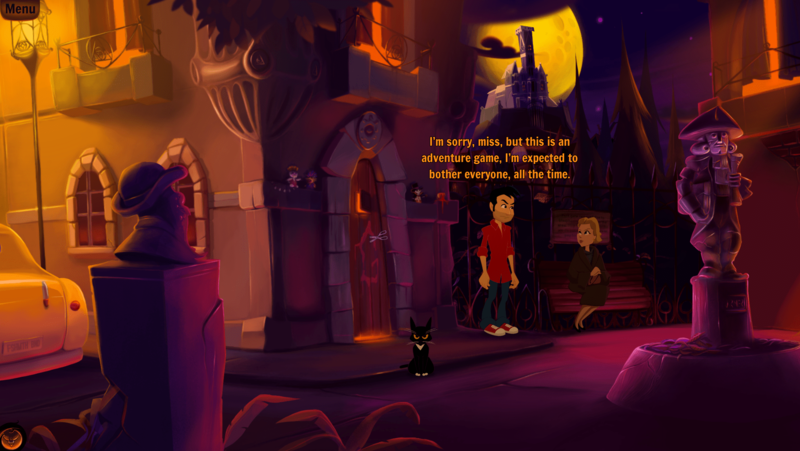 Luckily, Transylvania developer, Stuck In Attic has figured out that adventure games shouldn’t take themselves too seriously. With plenty of 4th wall shattering in-jokes and sly references, the Gibbous demo is already loads of fun. You play alternatively as one of the three main characters; Private Eye Don R. Ketype (I see what you did there), Librarian Buzz Kerwan, or Buzz’s sassy talking cat, Kitteh. The story has something to do with Buzz finding the fabled Necronomicon in a spoof of the Cthulhu Mythos. There are multiple and unique responses for all the random ‘hotspot’ items you encounter which keeps things fresh while you attempt to work out solutions. Stuck In Attic is looking for $40,993 to Gibbous to life. If that seems high, let me direct you to the beautiful hand-painted background and traditional frame-by-frame animations. The smooth animation and detailed backdrops make the game look stunning. Thanks to quality voice acting and an orchestral soundtrack, it sounds great as well. It really seems like all the best parts of old-timey Lucas Arts games, spiced up for the next generation. Kickstarter backers have some promising rewards to look forward to as well. Aside from a typical digital copy of the final game, they can also get art books, comic books, and for the especially invested, ($320 and up) a 3D printed, Kitteh statue. I know I’ve knocked rewards that relied on people wanting characters from unknown games on swag, but Kitteh is definitely going places. Track the progress of the Gibbous Kickstarter in our Campaign Calendar.